Tiffany Yeung, age 16, is a full scholarship student of Dr. Conrad Chow in The Phil and Eli Taylor Performance Academy at The Royal Conservatory of Music. Most recently, Ms. Yeung was the winner of the 2017 “Remember Enescu” International Violin Competition held in Sinaia, Romania and was the 1st prize winner at the 2017 Vancouver International Music Competition. For 3 consecutive years, she was the first prize winner at the Canadian Music Competition, as well as the grand prize winner in 2011 & 2012. Ms. Yeung has performed as a soloist with the Toronto Symphony Orchestra, Toronto Sinfonietta, Cathedral Bluffs Symphony Orchestra, Oakville Chamber Orchestra, Cambridge Symphony Orchestra, and the CAST Orchestra. Additionally, she has led the Toronto Symphony Youth Orchestra as Concertmaster and was the winner of the 2015 TSYO Concerto Competition. 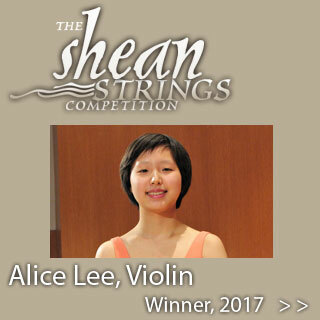 Ms. Yeung has performed in master classes with distinguished artists: Aaron Rosand, Miriam Fried, Elmar Oliveira, Joel Smirnoff, Almita Vamos, Grigory Kalinovsky, and Jinjoo Cho and has attended the NAC Young Artists Program, Summit Music Festival, where she was a winner of the 2017 Mary Smart Concerto Competition, and the Heifetz International Music Institute. Ms. Yeung plays on an 1836 Chanot violin on generous loan from The Royal Conservatory of Music.